Flensborg Fjord has one af Denmark's most charming stretches of coast. At Flensborg Fjord you will find cottages of a very high quality with unique locations. With a cottage at Flensborg Fjord is it obvious to take bike rides to, for instance, Sundeved, Als and Flensborg. In addition to swimming and angling in the fiord, a cottage at Flensborg Fjord also offers the opportunity of looking into the historic events of the culture and history of Denmark and Germany by visiting Dybbøl Mølle. 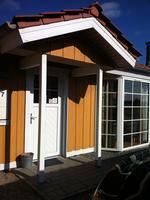 See the holiday homes in Flensborg Fjord on a map - click on the map! Modern cottage with view over Flensborg Fjord. 6 km from the border to Germany. Many holiday facilities, golf and historic sightseeings. 6 pers. From Dkr. 2.900/week. 6 persons 3 bedrooms Dishwasher Washing machine Sauna Woodburner Internet - Broadband Distance to beach: 200 m.
Lovely noch smoker cottage from 2004, 90 m2 for 6 persons. 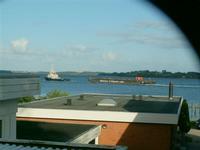 Views of Flensburg Fiord in wonderful nature area, 350 metres from the water. 6 persons 3 bedrooms Dishwasher Washing machine Whirlpool Sauna Woodburner Distance to beach: 350 m.
Charming 35 m2 loghouse in the first line towards Flensburg Fiord on 1154 m2 land. The perfect house for two adults. Please see photo at www.foto3869.dk. *****Internet*****. 2 persons 1 bedrooms Woodburner Internet - Broadband Pets OK Distance to beach: 100 m.
Lovely cottage of 70 m2 in Vemmingbund, 4-5 persons. 2 bedrooms, living room with couch. Kitchen, bathroom with shower. Beach 75 m.
5 persons 2 bedrooms Dishwasher Washing machine Woodburner Internet - Broadband Pets OK Distance to beach: 75 m.
Flensburg Fjord. Wonderful cottage for 6 persons - 63 m2 - with covered terrace and lawn with separate sun terrace. 100 m from the water. 3 bedrooms. 6 persons 3 bedrooms Woodburner Internet - Broadband Distance to beach: 150 m.
4 persons 2 bedrooms Woodburner Internet - Broadband Distance to beach: 100 m.